SEATTLE--(BUSINESS WIRE)--Sep. 27, 2017-- (NASDAQ: AMZN)—Today, Amazon announced the all-new Fire TV featuring 4K Ultra HD, High Dynamic Range (HDR), and Alexa Voice Remote. Forty percent more powerful than Fire TV Stick, the next generation of Amazon Fire TV works seamlessly with 4K Ultra HD or HDR compatible TVs giving you true-to-life picture quality and sound with vivid colors, 60 fps, HDR, and Dolby Atmos audio—all for just $69.99. With the most accurate voice search on a streaming media player, you can ask your Alexa Voice Remote to find, launch, and control content. Press the button on the Alexa Voice Remote and say, “Find dramas,” and Alexa will show you results from apps like Netflix, Hulu, SHOWTIME, Amazon Video, and more. Plus, you can pair Fire TV to any of your Echo devices to enjoy hands-free, far-field voice control, powered by Alexa. At just $69.99, the new Fire TV is Amazon's most affordable 4K enabled device ever. Fire TV is also the best place to enjoy Amazon Video’s expansive collection of movies and TV shows, including the largest selection of 4K/UHD content available to stream today. Enjoy hundreds of titles including Prime Exclusives like The Tick and The Grand Tour, and the lowest priced digital content of any over-the-top service across SD, HD, and UHD formats. 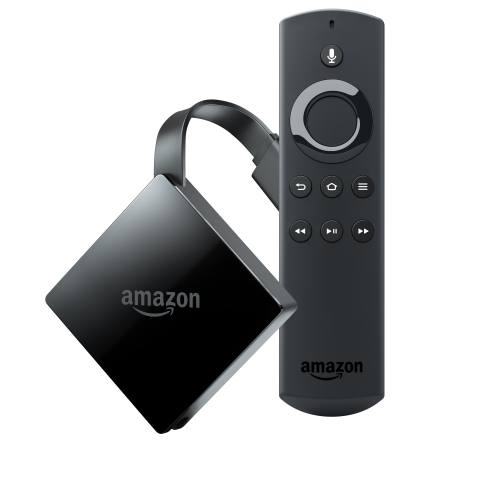 The all-new Amazon Fire TV is available for pre-order starting today from www.amazon.com/firetv and will begin shipping to U.S. customers on October 25. Get smooth and responsive performance with a 1.5 Ghz quad-core processor and dual-band 802.11ac Wi-Fi. Plus, the all-new Fire TV comes with 2GB of memory and 8 GB of storage in a new design that fits seamlessly behind your TV. Experience true-to-life picture quality from thousands of immersive 4K Ultra HD titles from Amazon Video, Netflix, and more when connected to a 4K Ultra HD or HDR compatible TV. Fire TV connects you to a world of streaming entertainment, with access to tens of thousands of channels, apps, and Alexa skills. You can watch over 500,000 TV episodes and movies from Netflix, Hulu, HBO, SHOWTIME, STARZ, Amazon Video, and more. In addition, enjoy live TV with subscriptions to Hulu, Sling TV, DIRECTV NOW, Sony’s PlayStation Vue, CBS All Access, and Amazon Video. Fire TV easily connects to your HDTV’s HDMI port. Simply plug it in, turn it on, and get ready to stream in 4K Ultra HD. Connect via Wi-Fi or directly from your router using the optional Amazon Ethernet Adapter and start streaming your favorite content. Fire TV is also working with leading partners to have single sign-on added to TV Everywhere apps like ESPN, NBC, ABC, Disney Channel, AMC, CNNGo, Food Network, E!, Freeform, USA, and more allowing you faster access to the content you love most. With Alexa, Amazon Fire TV can control smart home enabled lights, thermostats, and other compatible devices. Plus, play music, view camera feeds on your TV, check the weather, and more. Starting today, smart home camera support is available on all Fire TV devices and second-generation Fire TV Stick devices in the U.S. Simply say, “Alexa, show the nursery camera” to view the feed on your TV. Smart home camera support on Fire TV currently works on a range of devices from companies including Arlo, Ring, Nest, and August. Amazon Fire TV is available for pre-order on Amazon in the U.S. for $69.99 and will start shipping on October 25. For a limited time, customers can get the all-new Fire TV and Echo Dot together for $79.99 or the Fire TV Stick and Echo Dot together for $59.99—a 33 percent savings. Eligible customers who purchase and activate the all-new Fire TV by November 15, 2017 will also receive two months of Hulu (Limited or No Commercials), a one month trial of SHOWTIME, and a $10 credit to rent or buy content from Amazon Video– a value of up to $45. For more information, please visit www.amazon.com/firetv. Amazon also today introduced the all-new Echo with improved sound and a new design for just $99.99; the all-new Echo Plus with a built-in smart home hub for $149.99; and the all-new Echo Spot which features a stylish, compact design with a screen so Alexa can show you things for just $129.99.